Posted 10:10 pm by & filed under Events, Sponsored Walk, UK Specific, UK Specific. 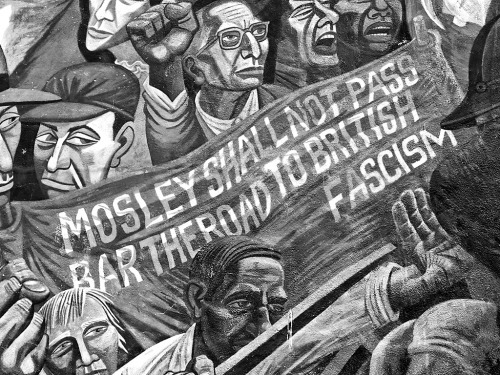 October will mark the 80th anniversary of the Battle of Cable Street and so we have joined up again with author David Rosenberg for a special ‘Anti-Fascist Footprints’ tour telling the story of communities coming together to oppose those who tried to set them against each other. This topic seems particularly relevant in light of the recent anti-Semitism debate and it will help us understand how fascism works in light of what Israel is doing today. During this sponsored walk and radical tour of London’s East End we will explore the struggles and stories of communities coming together to oppose those who tried to set them against each other. You will learn about how the East End resisted the invasion of Oswald Mosley’s fascists. You will learn why and how the Jewish People’s Council was created and what it did to stop the growth of fascism in the East End. At the same time we ask: is there a democratic process available for non-Jewish citizens in Israel or is it now headed for fascism? Join us on October 22nd from 2pm – 4pm for an insightful tour in order to raise much-needed funds for our UK programmes. We will also be gathering afterwards for networking and continued discussion in a local pub. We hope you will join us! Tickets are £15 with £15 minimum sponsorship requested. Download the flyer here and book your place today by emailing info@icahduk.org. To read a previous summary of an ICAHD UK sponsored walk in the city, please see this link.